Like the oil in your vehicle, the transmission fluid in your transmission needs to be serviced. As the transmission fluid ages, viscosity breaks down and contaminants build up, leaving your vehicles transmission vulnerable to breakdowns. 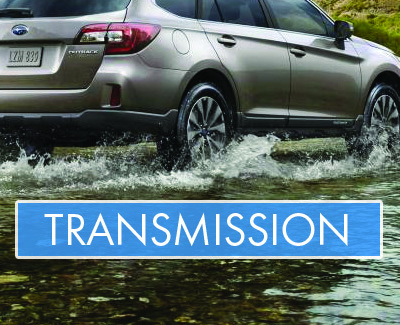 We at Subaru of Lethbridge know there is no engine component more complex and essential than your vehicle'ss transmission. Transmissions are responsible for shifting gears (automatically or manually) to dynamically change the speed-torque ratio in order to deliver power to the wheels in an efficient manner based on the speed of the vehicle. The reason for this is that engines output a high rotational speed which cannot be used for low speeds or starting. Using gear ratios, a transmission reduces the rotational speed and increases the torque (or “power” to the wheels) in the process. Q: HOW OFTEN SHOULD I GET MY TRANSMISSION FLUSHED? A: We recommend transmission flushes at 80,000km, however it all depends on the driver, vehicle style and what the vehicle is being used for. eg. Towing, City Driving, Highway or Rural Driving. Q: WHY SHOULD I GET A FLUSH ANYWAY? A: Like the oil in your vehicle, the transmission fluid in your transmission needs to be serviced. As the transmission fluid ages, viscosity breaks down and contaminants build up, leaving your vehicles transmission vulnerable to breakdowns. Q: HOW DO I KNOW IF I NEED MY TRANSMISSION REPAIRED?